When I first watched and saw The Falls’ video ‘Home‘, I was immediately intrigued. The melodic, beautifully arranged, kind of even-keeled song accompanied a video that was something totally different than what I had expected. With this video, The Falls make it crystal clear that they aren’t just another guy-girl duo in the coffee shop. 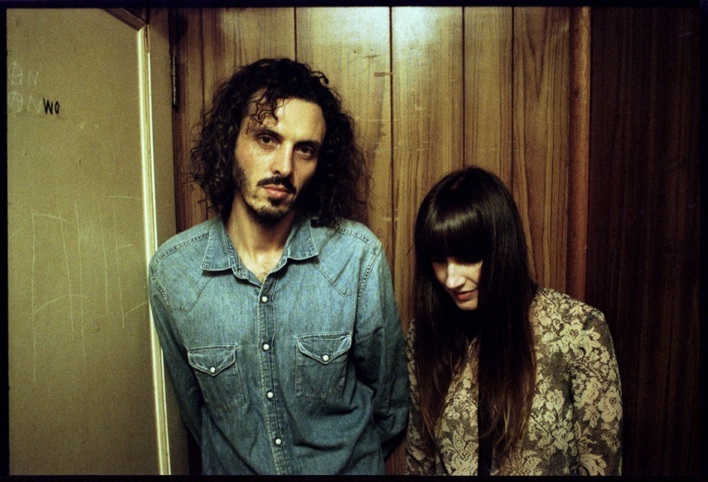 The more I read about The Falls, the more I saw that while their story (simply put: meet, fall in love, fight, make up, break up, stay in the band) might recall that of The White Stripes, they offer a completely fresh take on the perspective of the kind of intimate relationship you form while being in a band with someone else, let alone your ex. I was able to do an email interview with Melinda from The Falls earlier this week, read on below to learn more about The Falls, their relationship, the concept behind the music video, the kind of music they play and what to expect next from them. Music has been all I have wanted to do for as long as I can remember. However, I was very shy growing up and never imagined I would end up where I am now. When Simon and I began writing these songs together neither of us had sung before and initially, we were going to get someone else to sing them. A good friend heard our demo’s and encouraged us to do it. I am so glad that he did! How long have you been playing together? Do you think having been in a relationship together in the past makes for a different performance dynamic than other bands? Do people ever compare you to the White Stripes because of your ex-relationship? We’ve been playing together now for almost 6 years now. I think having been in a relationship together has given a real rawness and honesty to our live performances. Often our songs serve as reminders of things that have happened in our relationship and can bring back strong memories and emotions. It is not always easy laying yourself bare like that onstage, so I think that makes our shows very emotionally charged at times. We definitely get compared to the White Stripes, but more often to Fleetwood Mac! Can you explain a little about the concept for your video “Home”? I guess we wanted to do something different with our video clip and challenge peoples’ perceptions of the song We think director Johnny Welch did that beautifully. He had some great insights into the lyrics that he explored in a much darker way than I think most people expected. One of the ideas the video raises is escapism, and that we often dream of a life different to the one we have. That sometimes you need to accept what life presents you with and recognise that the grass isn’t always greener elsewhere. Maybe, where you are is exactly where you’re supposed to be. Home. Eating cheese, growing herbs and tomatoes, cooking and reading. How did you decide to name your debut EP Hollywood? Do you think it reflects the way your relationship is showcased through your songs? When we began to put the songs together for the EP, it became clear very quickly that it was the story of us. How we met, fell in love, fought, made up and broke up. The first song on the EP ‘Please’ is one of the first songs we ever wrote together. The last song ‘Hollywood’ was finished in the studio as we recorded it and was largely inspired by the time we spent playing each week down at the Hotel Hollywood in Surry Hills. We realized how significantly our time at the Hollywood was connected to everything we’d been through that we couldn’t have called this EP anything else. I think I admire anyone who has courage to follow their passion. Not breaking up the band when Simon and I broke up, and recording our debut EP. Every aspect of being a musician is satisfying for different reasons, be it writing, performing, practicing or recording. My favourite part is the certainty of knowing there is nothing else I’d rather do. Do you think the music industry treats female musicians differently to male musicians? Do you think it’s more difficult for women to establish themselves? I think women are still treated differently to men in a lot of industries, even though it might not be as obvious as it once was. I think what has changed though is women’s confidence and self assuredness. I think they are less likely to be discouraged by any inequality they encounter and more likely to dismiss it or become even more driven to succeed because of it. How much time do you spend using the internet to promote your music? Too much! Mainly because I am too easily sidetracked when I’m working online and end up reading about an exhibition I’d like to go to or looking at pictures of my niece and nephew, instead of promoting my music! What’s next for The Falls? A lot of touring! We just found out we’ll be joining Passenger on his Australian Winter Tour in August. We’ll also be playing BIGSOUND in Brisbane in September and setting out on our own ‘HOLLYWOOD’ tour in September /October. This entry was posted in Music and tagged Fleetwood Mac, Hollywood, home, The Falls, The Falls Interview, The Falls Tour Dates, The White Stripes. Bookmark the permalink.